The phrase that “All Real Estate Is Local” contains a lot of truth in Real Estate and especially for our Pennsylvania, Chester County Real Estate and Philadelphia Main Line area. We have a varied mix of home styles and home price ranges sometimes within neighborhoods. Each year Realtor Magazine together with Remodeling Magazine* publishes their Cost vs Value edition with statistics on resale value investment return. These are Regional differences but It’s also true that Chester County may differ from Delaware or Montgomery County or style differences between Single Family Homes or Town Homes. 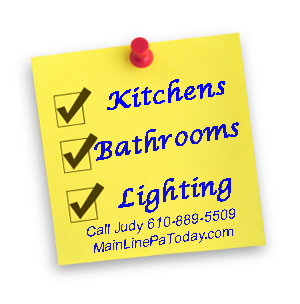 My clients seem to be most impressed with Kitchens and Bathrooms and often comment on Lighting. Lighting isn’t on the list but in my experience it should be. When a home buyer says, “It seems dark in here”, it’s not good news for the Sellers home I’m showing. Especially here in the Northeast. Good lighting can punch up the WOW factor for a modest investment! Enjoyment, Investment or Resale Value? There’s no such thing as a dollar for dollar return on Home Improvements. But some home improvements have a better resale value than others. Consult with a Realtor like me before major renovations. Don’t price your home out of your market. For example if resale value is important to you, think twice about Italian Marble or Brazilian Cherry hard wood in a $300,000 town home in Chesterbrook. The Philadelphia area seems to lag the 2008 National Averages and the Mid Atlantic Region for return on investment. It’s also interesting to note that major kitchen or bath remodeling and minor remodeling have about the same return on investment. Good news for our budget conscious times. New construction is down dramatically in our region. So this might be a good time for some Home Improvement dreams to become a reality. You might be able to negotiate more now than when the market fully recovers. Do be aware that Realtor Magazine does cite a 12% Annual Rate of decline on home improvement investment. So check in with the Professionals and choose wisely. Quality work and materials count in resale. 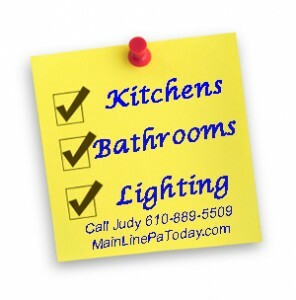 Contact or call me 610-889-5509, Judy Peterson Prudential Fox and Roach Realtors, Devon Home Marketing Center if you would like a professional opinion about your homes value and home improvement projects. This entry was posted on Wednesday, January 14th, 2009 at 7:42 am	and is filed under Financial, Home Buyers, Home Sellers. You can follow any responses to this entry through the RSS 2.0 feed. You can leave a response, or trackback from your own site.